I find myself reading a lot about hunting these days. First, I just finished Born to Run by Christopher McDougall. “A Hidden Tribe, Superathletes, and the Greatest Race the World Has Never Seen”. What could be better than that? This book is about the Mexican Tamahumara Indians and their secrets to long distance running. The book is a page turner. My favorite quote is from a runner in his 90s who said “you don’t stop running because you get old; you get old because you stop running”. One of the questions McDougall explores is The Running Man theory: whether humans were designed to run long distances. He cites research from evolutionary biologist Dennis Bramble, of the University of Utah, and Daniel Lieberman’s team at Harvard, that provides evidence, including unique human physical traits, that would confirm this theory. I’ve also been slowly reading Lieberman’s Story of the Human Body. This book is part evolution of the human body and part healthy living book. I’ve really struggled with the dryness of evolution texts in the past but Lieberman has created a very interesting account. His thesis is that humans are experiencing so many diseases now because we did not evolve to deal with many of the environmental or lifestyle challenges facing us now. He does explain that while humans are not particularly fast or strong, we are designed to run long distances. As one example, the fact that we sweat rather than pant give us a unique advantage over other animals. Even though Bramble & Lieberman provided a compelling argument that humans had many adaptions suited to running, the big question was “what advantage does the running man theory provide humans?” Their research found that humans became carnivorous well before sharp spears and bows and arrows were available. So, how did they track down their prey? Lieberman calls it “persistence hunting”. They literally run them to death. Even though their prey can significantly outrun humans for relatively short distances, they need to stop to recover. Humans are able to run long distances & this persistent pursuit is what enables them to ultimately overtake their prey. Lieberman also addresses the transition from hunting to farming. It ultimately lead to our continually evolving culture which is where humans are now “evolving” most rapidly. But the transition to farming also introduced many health-related issues for humans. Jared Diamond called the transition to agriculture “the greatest mistake in the history of the human race”. Wow, that’s harsh! His position was based on farming leading to a more restricted diet. Because of the narrow human diet, famine would cause starvation because we became so dependent on a limited diet. The other downside was that farming allowed humans to live closer together, which introduced the spread of infectious diseases. The last book that I read in my hunting series is Hunters in a Farmers World by John Dini. Dini, a prolific writer and also a legendary TAB Business Owner, explains that present day entrepreneurs are the equivalent of historical hunters. While “persistence hunting”, where a group of humans pursues their prey, may make it seem like all humans were hunters, clearly not all hunters were equal. Someone was leading the group of the hunt and directing each participant where to go. They were developing strategy and calling the shots to give the group the greatest chance of having dinner that night. These are the hunters Dini is referring to. Hunters build the business; farmers run the business. 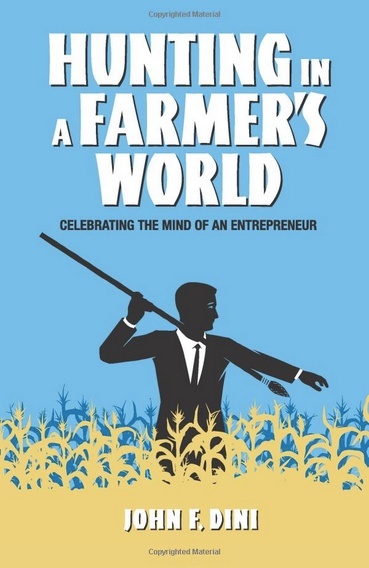 Hunters in a Farmers World is a multi-faceted book. On one hand, it is a celebration of entrepreneurs and the risks they’ve taken and the accomplishments they’ve made to our economy and the lives of others. Dini takes care throughout the book not to take the perspective of “hunters are good & farmers are not”. As a proud farmer myself, I found Dini’s perspective to be balanced. In order for a business to run successfully, it involves hunters and farmers working together in balance. This book is not theory. It provides one real business example after another involving successful hunters. It also provides unsuccessful examples to teach how not to approach an opportunity. Unlike any other book that I’ve read on this subject, “Hunters” takes on the real issues that entrepreneurs face in starting and running their business. This book is clearly written by someone who is a hunter, has worked with many hunters and intimately understands the complexity of decision making facing hunters. For example, how do you compensate new sales people? What should your role as owner be in the day-to-day of the business? What loyalty should you have to your employees? And even, how much money should you be earning from the business? Hunters don't defend their failing solutions. Hunters never quit. There are no defeats, only setbacks. No one is really, really good at doing something he doesn't like doing. Successful hunters hunt. They decide what needs doing and they do it. If owning your company is a lousy job, the uncomfortable reality is you made it that way. Great employees make you money. Poor employees cost your money. There's one bit of wisdom after another throughout this interesting book. If you wonder whether you are a hunter or not – wonder no more. Read this book and it will become very clear. A great example of a hunter that Dini explains is Chaz Neely who had to sell his house twice in the interest of his business - the first to save it during the S&L crash in the 1980s & the second to grow it once he survived the recession. Now that is a hunter!